Over the course of the next few weeks, I will be re-engineering Police Incident Command according to The Illinois Model law enforcement operations system (LEOpSys). Most of the ideas aren't earth-shattering, but they suggest some small adjustments to the nationally-mandated program. These first several posts lay some foundation into our vision of what IC should be. Click on the Incident Command label for all posts in this short series. This is Part Two. Incident Command is all about solving problems. Unfortunately, that's an idea that can be lost in complicated policy and systemic bureaucracy. Because public safety "problems" are so diverse, officials have found it to be difficult to apply a singular process in solving them. We contend The Illinois Model LEOpSys is a universal policing system that has effective application as a template for Incident Command for any and all problems. These steps are the foundation to solving problems. They are more important than officer accountability or roles, delegating tasks, establishing command posts, or identifying additional resources. In fact, these three steps are so broad, they can be applied to any problem in any industry or part of life. So how does this generic method get tailored to public safety or law enforcement? These are all problems. Some bigger or more serious than others. Some are crimes; some are not. The threats may be to others, self, officers, or a greater public community. But they are all problems, and they're all hungry for a solution. The next tier on The Illinois Model is Mission-Objective . What "solution" options are available? In plain language; no jargon. Does a person need to go to jail? Does a person need to go to the hospital? Does an area need to be searched for danger? Each of the above listed "problems" come with Search and Seizure issues. Some are clear-cut; some are not. Some of the situations have multiple simultaneous problems. Which problem is more serious? Which is more pressing? Can the officer search (or be, or stand, or open, or look, or go) where s/he is? Can the officer seize (or stop, or arrest, or detain, or restrain) the person? Not all of the above listed situations rise to the level of Reasonable Suspicion or Probable Cause to take action. And against what many officers believe, this legal standard still holds for those cases that are NOT criminal in nature! 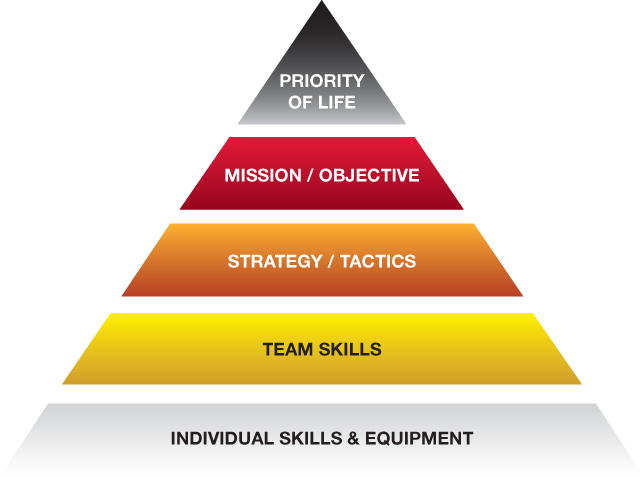 At this Mission-Objective tier, police officers and Incident Commanders must determine the resolution or the goal of their response. Some of the above situations have very unstable legal footing...which is hard to communicate to other responders. The third tier on The Illinois Model is Strategy-Tactics . Here we see the plans on HOW to achieve the goal(s) from the previous step. One of the first questions to be answered is: How big of a deal is this? This might be better answered with: What is the urgency? Is there a critical time component to the problem? In the case of the officer bleeding from gunshot wounds....time is a very important factor to survival. But in the case of the armed and barricaded man wanted for domestic battery...time is not important. The situation is dangerous, but it is not urgent. Urgency relates to the TIME component. There are two opposing strategies or plans in policing: Acting and Stabilizing. (Read Police Operational Philosophy for more on this topic.) Simply put, if there is low or no urgency, officers should Stabilize; if there is urgency, officers should Act. We contend that officers should default to Stabilizing strategies unless one can articulate and justify an urgency. 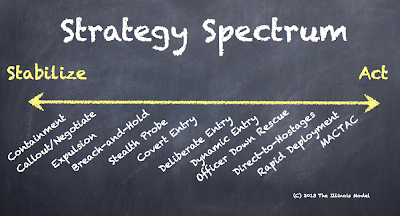 This includes reverting back to Stabilizing strategies once the urgency is gone (ex: the officer is rescued, the fleeing vehicle stops/crashes, the resisting arrestee stops fighting, the hostages are safe, etc). Before any officer or group/team of officers is given a task, role, or responsibility, they must be responding at the same "speed" or within the same strategy. Imagine an active shooter in a shopping mall where some officers stayed outside (stabilize) when the rest of the officers to go inside (act). Or on a barricaded gunman call, imagine some officers deciding to go inside (act) when everyone else is forming a containment (stabilize). Officers have to be acting on the same speed or "level of intrusiveness." Sure there are cases when there are two simultaneous problems, each calling for a different strategy, but we aren't ready to have that discussion.....yet! But we will. To be a cohesive response, police officers must not only know what their goals are, but also share a common strategy or plan. Once these three foundational issues of dangers, lawfulness, and strategy are communicated, then roles, responsibilities, accountability, and the other various tasks can be discussed. It's in the face of crisis and extreme urgency that conveying the big picture is most needed. Get out the most important information first! The questions at the top tiers of The Illinois Model are for leaders; as one moves down the tiers, there is more need for managers. In Incident Command, we need leadership and management skills - in that order. This perspective on Incident Command (using The Illinois Model) allows us to properly prioritize the issues for a safe, legal, effective, and community-accepted response to public safety problems. Louis Hayes is a co-developer of The Illinois Model™ law enforcement operations system (LEOpSys) and moderates several courses rooted in its theory and concepts. He is a 15-year police officer, currently assigned to a multi-agency tactical unit in Chicagoland. He's doing his best to push out the bureaucratic "forms and checklist" attitude and bring in the crisis thinker and problem-solving mentality. A full compilation of articles on The Illinois Model can be found here.